Police have unveiled a new street art installation in central Auckland, recreating the extraordinary work story of an officer who prevented a young man from acting out thoughts of suicide. 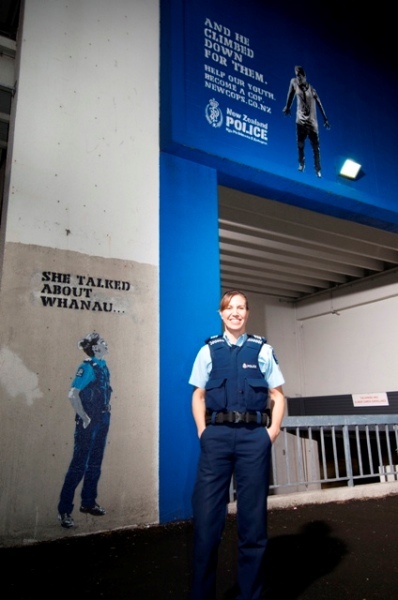 The street art, installed at 101 Hobson St, is part of a campaign to attract young New Zealanders to a police career. Sergeant Dee Teao used her skills as a youth aid officer and police negotiator to talk a young man down safely from the dizzying heights of an over bridge. On the night the incident occurred a troubled young man was on a bridge in danger of jumping or falling off. Dee assessed her options and called up to him. She spoke with him about his whänau, his tamariki and what was troubling him. She appealed to him to not cut off his whakapapa. "What would your whanau do without you?" she asked. Gradually she built up enough rapport to climb up to the man. At the top Dee changed tack and admitted she too was scared of heights. Admitting her vulnerability caused the young man to stop thinking about himself and become concerned for her safety. Eventually they both climbed down together and he said "You're a cool cop miss." Deputy Commissioner Viv Rickard says "Policing is renowned for better work stories. This extraordinary true story shows the heart, and the mana, that our staff have and that we want to find in all new recruits. By installing this street art we want to challenge young people's perceptions - that when you become a cop you don't lose who you are, you use who you are to help people." OUTLine 0800 688 5463 (confidential telephone support for sexuality or gender identity issues). In an emergency, always dial 111.